Upright GO Reviews - Is It Legit or Hype? Upright GO combines slick technology and a simple app to help you know when you’re slouching and, ultimately, help you form good habits that lead to better posture. 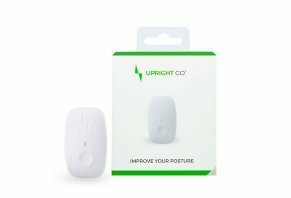 Upright GO Review: Will It Help to Correct Your Posture? Upright GO is a wearable posture-correction device that uses motion-sensing technology and gentle vibrations to let you know when you’re slouching. The device is unique in that it’s small and tracks your slouching much in the same way that a Fitbit would track your sleeping. It relies on technology, whereas other posture correctors we’ve reviewed rely on bulky devices to keep your back straight. The company behind the Upright GO is Upright Technologies, Ltd., and is based in Israel. The company actually has two posture correctors, the other being the Upright PRO. PRO was the first device they released and, based on photos we’ve seen from Amazon, it is bulkier than the Upright GO. There are two facets to this product: the device and the app. The device itself is just a couple of inches long and less than two inches wide. To put it on your skin, you’ll use the alcohol pads included in your shipment to clean the area on your upper back to which you want to stick the Upright GO. Then, stick to your upper back one of the hypoallergenic adhesive gel pads included with the device. According to various reviews we’ve read, the adhesive they use doesn’t irritate your skin and, once you’ve to the device on your back, you hardly know it’s there. The device has two settings: vibration and tracking-only. Basically, the vibration setting will enact a vibration alert intended to remind you to sit up straight. At the same time, the device is communicating with the Upright app to track your posture. When you open the app, you’ll see tracking timeline. Red sections of the timeline indicate times at which you slouched, whereas green indicates times at which you had good posture. When you set your device to tracking mode, it doesn’t initiate a vibration alert. Your Upright GO will silently track your posture. You can view the results in the app. The app will also set up a training program for you that challenges you with daily goals focused on maintaining good posture for a certain amount of time. This training, along with precise tracking, is intended to build a habit of good posture. The product’s website notes that the device can start improving your posture in as little as 14 days. What makes the Upright GO such an interesting product is that it attempts to solve a problem that’s pretty pervasive in the United States: bad posture. According to the American Chiropractic Association (ACA), bad posture can lead to a variety of conditions. While the ACA doesn’t provide any specific data regarding the number of back injuries caused by poor posture, it does note quite frequently that bad posture can lead to back pain and back injuries. Once you choose the option you want, the site will take you to a page that pitches a three-month supply (10-pack) of adhesive pads and alcohol wipes for $6.97. Adhesive pads are available on the Upright website at $6.95 for 10 pads or $13.95 for 30 pads. The product's website states that the Upright GO has a 30-day money-back guarantee – if it doesn’t work, you can send it back and get a refund. However, there are some very specific criteria you need to meet in order to make the return, criteria which require you to use the app and provide your results to confirm that your posture didn’t improve. The fine print we read through said that to qualify for a refund, you have to meet your daily goal at least four days in a row via the app. All the accessories you received with the device need to be included with your return and the Upright GO must be in “good physical condition” – it can’t be damaged or broken. If you don’t include all the original parts in the return, the fine print says you could be subject to a 15% restocking fee. We checked out Amazon reviews of this product and found that it rates pretty well with its customers. More than 590 reviewers gave it an average of 3.9 stars. Common phrases used in reviews were “easy to use,” “highly recommended,” and “super easy”. The main complaints about the product focused on how the adhesive pads did not work and the device kept falling off. One reader suggested buying double-sided skin tape as an alternative to the pads. We found a pack of 50 double-sided tape strips on Amazon for $9.15. The Upright GO has two types of competitors: back-brace style posture correctors and movement/strain detectors. Two back-brace style posture-correctors we have reviewed are Posture Back Fix and Royal Posture, both of which cost $19.99 and are basically a back brace that physically moves your back into the right position. These solutions can be tough because they may or may not fit you well and they start your posture correction immediately – you don’t consciously choose to correct it yourself. While it may seem counterintuitive, we believe this is a drawback because it isn’t teaching you to maintain good posture on your own as the Upright GO does. In other words, your posture may change while wearing these braces but your habits don’t change. Movement and strain detectors, on the other hand, help you build good habits because they make you sit up straighter on your own. Two of these types of products that we’ve reviewed are the Upright PRO and Lumo Lift. At the time of publishing, the PRO cost around $170 on Amazon. The main difference between this device and the GO is that it’s bigger and it ships with 60 adhesive pads. The Lumo Lift was only available on the secondary market at the time of publishing. What makes the device different than the Upright offerings is that it’s small and flat, and its app tracks your posture as well as the steps you’ve taken and the calories you’ve burned throughout the day. We believe that Upright GO is an innovative way to correct posture because it leverages your habits in order to correct your posture, whereas back braces do all the work for you. The reviews of the product were positive at the time of publishing, indicating that most customers were satisfied with their experience. Keep in mind that the main issue with Upright GO may be how well it sticks to your skin. Those with oily skin or who sweat a lot may have issues keeping the device on your back. If you run into this problem, double-sided skin tape may be a workable solution. The main drawback to this device is price, as it’s considerably more expensive than back-brace style solutions for poor posture. If you want to learn more about the effectiveness of posture products, take a few minutes to read through our analysis about how effective they and whether or not they’re worth the price tag. In the guide, we talk about stability balls, seat-style posture correctors, foot hammocks and more. Write a Review for Upright GO!